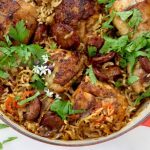 Easy Honey Balsamic Chicken that is made with chicken thighs and a fruity raspberry balsamic vinegar marinade, for the loveliest sweet and sour flavors. Started in my cast iron skillet and finished in the oven with roasted butternut squash. 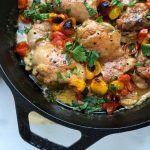 These honey balsamic chicken thighs are everything you guys! 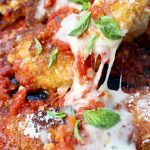 Easy, flavorful and nutritious, you really can’t beat this weeknight dinner. 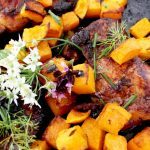 Simply whisk up a honey balsamic marinade, and while you cut up the butternut squash the chicken thighs will marinade themselves on the kitchen counter. The recipe calls for a fruity raspberry or fig balsamic vinegar, but you can use a plain variety If that’s what you have on hand. I love that special something the fruity kind ads to the chicken. Talk about a match made in Paradise, right? 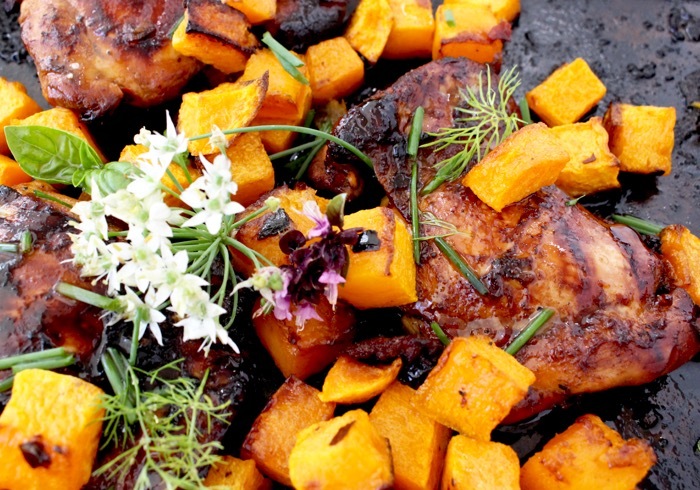 Sweet caramelized butternut squash and honey balsamic chicken is simply meant to be! 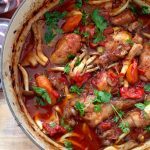 Using the boneless skinless thighs will help you get a fabulous chicken dinner on the table in about half an hour on a Tuesday. I like to start my chicken in the cast iron griddle, it helps seal in all those juices and starts a nice caramelization, before I transfer them to the oven with the butternut squash. You could of course make this a one sheet pan chicken dinner by throwing everything together in the oven at the same time. In this case make sure that everything has enough space, preferably without touching each other. Also you’ll need to increase the cooking time by 5 to 10 minutes for the chicken to cook through until it reaches 165”F. If your heart so desires you can also make a quick balsamic glaze on the stove top while the chicken is cooking. This way you’ll have that extra sauce to drizzle on top. I do that with my roasted beets too, sooo good kids! 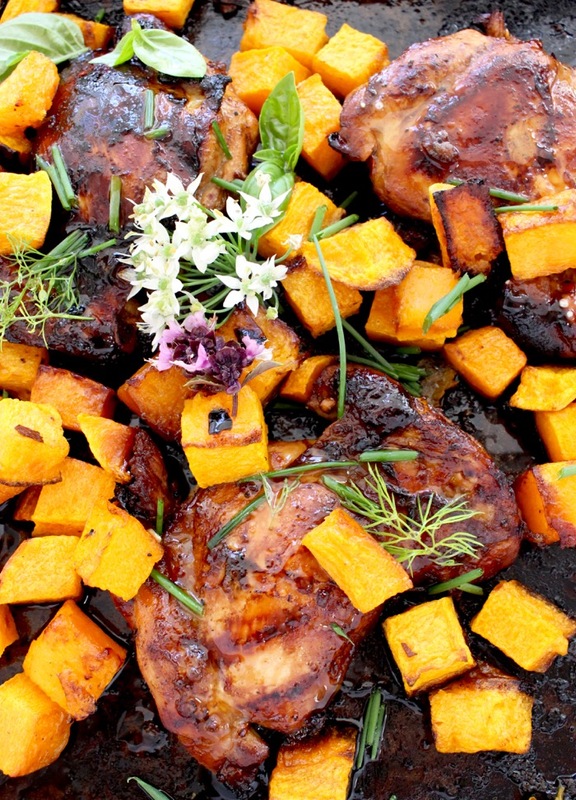 Easy Honey Balsamic Chicken that is made with chicken thighs and a fruity raspberry balsamic vinegar marinade, finished in the oven with roasted butternut squash. In a medium bowl whisk together the balsamic marinade ingredients. Add the chicken thighs and toss to coat well. Allow to sit at room temperature for 20 minutes. On a large baking sheet toss together the cubed butternut squash with 1 tablespoon of olive oil, a good pinch of sea salt and red pepper flakes. Toss to coat well and bake in the preheated oven for 10 minutes. Meanwhile preheat a cast iron griddle. Using kitchen tongues take the chicken out of the balsamic marinade and drain well. Grill them on medium high flame in the skillet for 1 minute on each side, just until nice grill marks form. Transfer to a plate, set aside and keep warm. 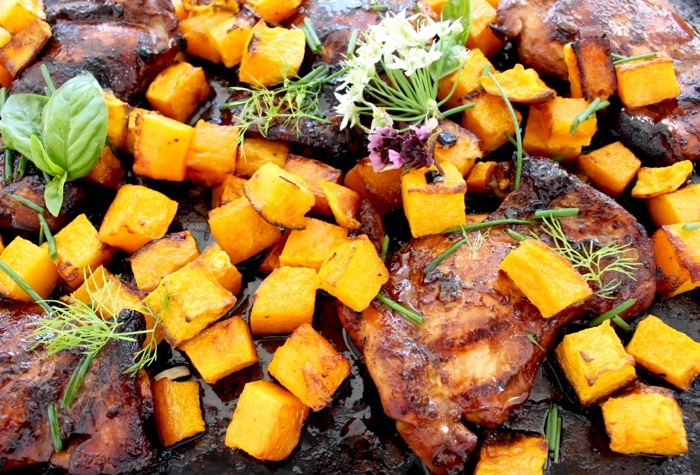 After 10 minutes in the oven, use a spatula and turn the butternut squash cubes. Gently push them around and make space for the chicken thighs, preferably without touching each other. Pour in any juices from the plate with the cooked chicken as well. 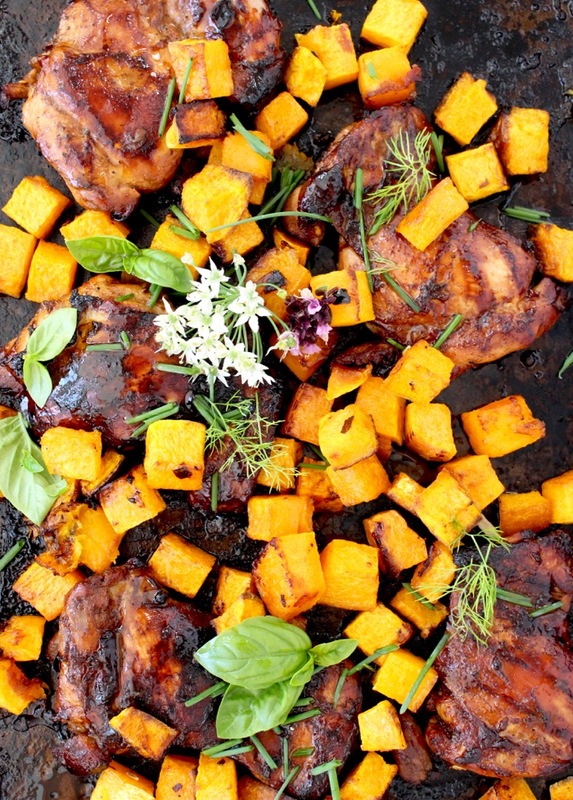 Drizzle the butternut squash and balsamic chicken lightly with some olive oil and bake together for an additional 20 minutes, or until the chicken is cooked through. To make extra balsamic reduction simply add the balsamic vinegar and honey to a small sauce pan. Bring to a simmer and reduce by half, until it coats the back of the spoon. Serve the balsamic chicken hot with a drizzle of olive oil, balsamic reduction and a nice squeeze of lemon. Garnish with fresh herbs. You may serve the chicken with some balsamic reduction on the side. We made this chicken tonight and it turned out perfect. Wish I had doubled the recipe for leftovers because we couldn’t stop ourselves from eating the whole pan. Will do a repeat for Sunday dinner.